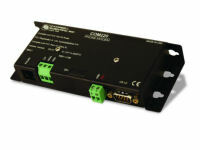 The COM220 modem enables communications between a computer and a Campbell datalogger via a public switched telephone network. Offers both modem enabled (ME) and synchronous device communications (SDC) modes. Allows user to set the number of rings before answering call.